How About Some Autumn Splendor??? Let me share what the Design Team has done with the kit this month. Check out this gorgeous tag by Amber. And this stunning layout by Denise. Welcome aboard Denise! Also making her debut is Wendy. Isn`t this card a show stopper? 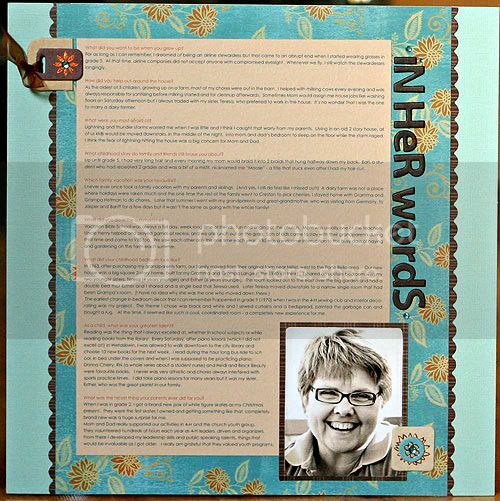 Look at this beautiful layout from Heather - I love the "interview style" journaling. Just look at this eye catching card by Jen? You know what? 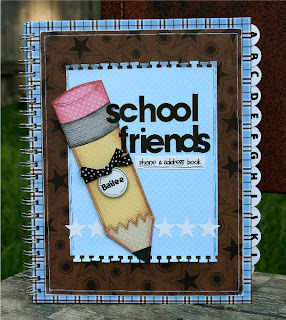 There is even more inspiration in the Scrap Shotz gallery - you will not be disappointed! I've got so much to share ... but I'll leave you with a couple of teasers! Don't forget to come back on Friday to see something rockin'!!! *wink* *wink* And set aside time this Saturday to join us for the World Card Making crop! There are some awesome challenges and prizes to be had! It's card day today! 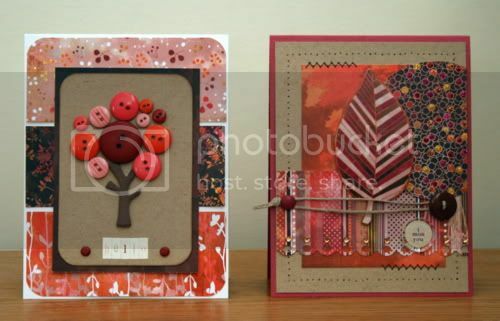 I'd like to share a few cards made by Laurel with the last Scrapshotz kit... fabulous work!!! The air has that crisp autumn feel to it these days and I've seen the leaves starting to change to show off their glorious colours. 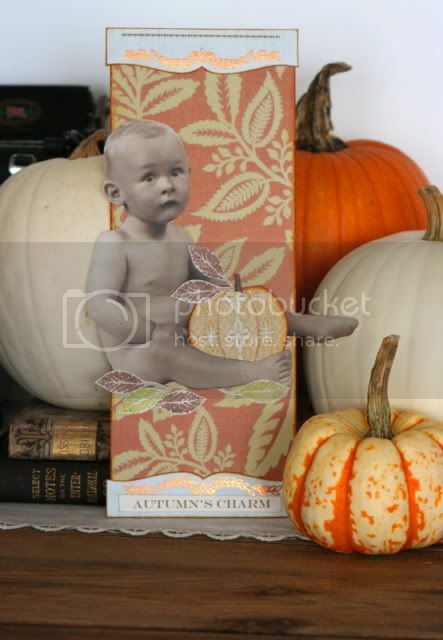 ScrapShotz also has that crisp autumn feel in the air and the colours are warm and vibrant. 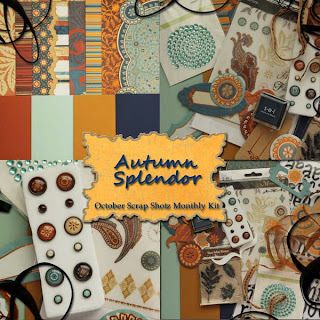 Yes, I'm talking about the new October Kit "Autumn Splendor" and the new Card Kit "Summers Encore"
The October Kit Features the gorgeous Moravia Line from SEI. The rich colours and beautiful patters with this kit are perfect for all your fall photos. Think of kids and leaves, pumpkins, warm spices. Mmmmm, this kit if perfect. 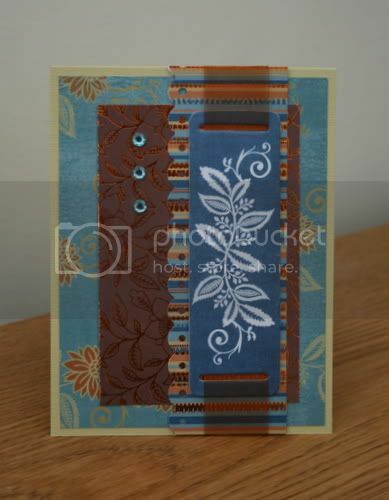 Our newest card kit features the oh-so-gorgeous Basic Grey Indian Summer line, what a stunner! The colours are so gorgeous and vibrant. You can't not make beautiful cards with this combination! These are ready to go right away and ship for the economical price of $2.50. Quantities are limited so get yours today! 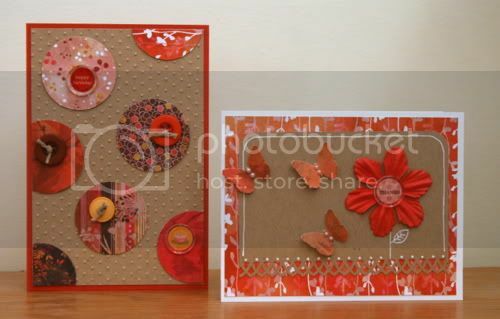 Our lovely Jen made some gorgeous cards with this fabulous kit. Check them out and get your kit today!!! This layout by Stevie brings summer to a close with a stunning photo and a wrap up of summer for 2009! As many of you kow... there are some big (and some secret) changes coming to Scrapshotz! While we're sad that Nonie's term as blog coordinator is over...we are happy to say that Virginia will be taking over the position! She has some very exciting stuff in store for you! Watch for tutorials, product demos, and a new set of challenges to be posted on the blog every week! While the blog changes are exciting... even more exciting will be what the new Creative Team members will have in store for us! Lately I've been in quite the creative funk. I know it has a lot to do with all that is going on in my life and that almost all of my stuff is still in boxes from our recent. However, I've been wanting and needing to create so to kick my creativity into gear again, I go with my old stand-by - scraplifting. I recently found a new designer's blog that is very inspiring and decided to use one of her layouts to lift. Her name is Stephanie Dagan and her work is absolutely amazing. As soon as I saw her blog, I bookmarked it and knew I wanted to lift one of her layouts. The one I chose is titled "un jour". 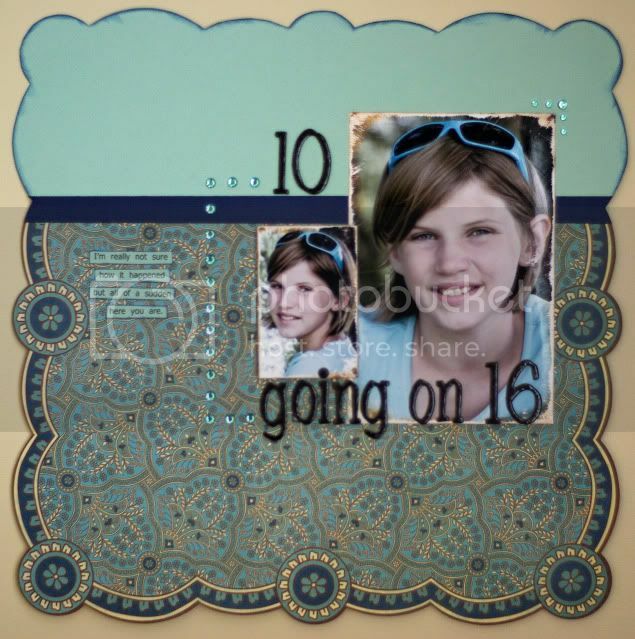 Since the hardest part of any layout for me is the design, that's what I usually scraplift (Sketches are awesome for me as well). But if you struggle with other parts (like journaling, titles, color combos) "lift" those from other layouts or be inspired by them to jumpstart your creativity again. 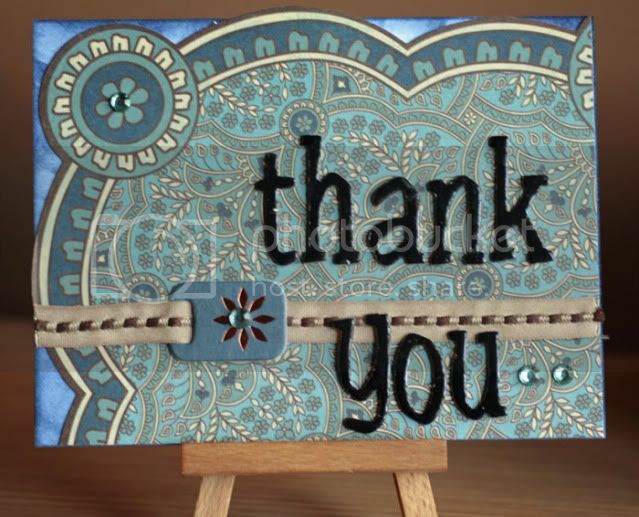 For me, once I do a scraplift, I find myself back in the groove again able to create my 'own' work. I always learn something new in the process and try something I wouldn't normally try (like using all those patterned papers on one layout). What's your old stand-by for getting your creativity going again? Are you ever at a loss about what to do with all those journalling spots? Well look no further! 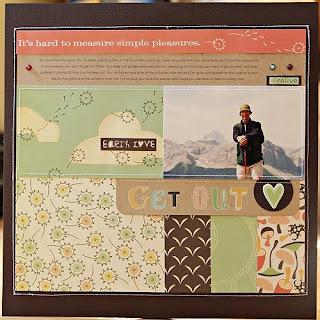 Denise uploaded three amazing layouts for us this week... all using multiple journal spots! Thanks for the ideas Denise! I can't believe that my kids go back to school in a few days. (in fact, we just had registration today!) It's rather bitter sweet for me this year though because my youngest starts Kindergarten. While I'm excited for him to go I'm a bit sad that I won't have him around. Now, to get me wrong - I am definitely looking forward to those 3 hours alone!!! Most definitely!! 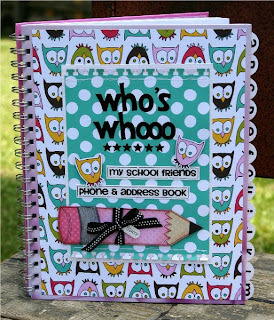 While I was thinking about back to school and all the items that we have to purchase and get ready for our kids to take with them I was thinking about making a little address/phone book for my daughter. I seem to find these little pieces of paper with numbers all over her bedroom and (bad mommy that I am) have often thrown them out. I know. How could I ever have done that! Anyways, I was perusing the web the other day I came across some fabulous examples of exactly what I'd like to do. The talented Shanna Vineyard created these for her daughters. Aren't they just adorable? They're exactly what I had pictured in my mind! 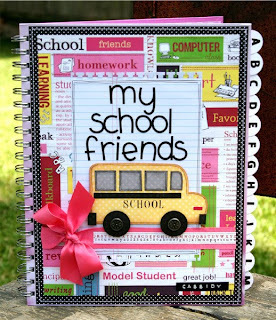 So, what scrapping goodies have you made for back-t0-school. Are you making things for the teachers, for your kids? I admit that I usually don't bother because I've got enough stuff to get ready. But with my daughter's birthday being the 5th I think she'd be thrilled to get something like this.